Love it or hate it, broccoli is touted as a superfood, offering an array of health benefits. And it's about to get even more super. 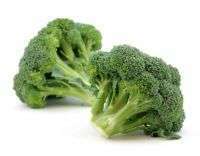 University of Illinois researchers have identified candidate genes controlling the accumulation of phenolic compounds in broccoli. Consumption of phenolic compounds, including certain flavonoids, is associated with a lower risk of coronary heart disease, type II diabetes, asthma, and several types of cancer. "Phenolic compounds have good antioxidant activity, and there is increasing evidence that this antioxidant activity affects biochemical pathways affiliated with inflammation in mammals. We need inflammation because it's a response to disease or damage, but it's also associated with initiation of a number of degenerative diseases. People whose diets consist of a certain level of these compounds will have a lesser risk of contracting these diseases," explains U of I geneticist Jack Juvik. The researchers crossed two broccoli lines and tested their progeny in terms of total phenolic content and their ability to neutralize oxygen radicals in cellular assays. They then used a genetic technique called quantitative trait locus analysis to search for the genes involved in generating phenolics in the most promising progeny. By identifying the genes involved in accumulating these compounds, the researchers are one step closer to breeding broccoli and related Brassica vegetables like kale and cabbage with mega-doses of phenolic compounds. "It's going to take awhile," Juvik notes. "This work is a step in that direction, but is not the final answer. We plan to take the candidate genes we identified here and use them in a breeding program to improve the health benefits of these vegetables. Meanwhile, we'll have to make sure yield, appearance, and taste are maintained as well." The good news is that phenolic compounds are flavorless and stable, meaning the vegetables can be cooked without losing health-promoting qualities. Once these vegetables are consumed, the phenolic compounds are absorbed and targeted to certain areas of the body or concentrated in the liver. Flavonoids spread through the bloodstream, reducing inflammation through their antioxidant activity. "These are things we can't make ourselves, so we have to get them from our diets," Juvik says. "The compounds don't stick around forever, so we need to eat broccoli or some other Brassica vegetable every three or four days to lower the risk of cancers and other degenerative diseases." Meanwhile other research showed that we have cause and effect around the wrong way when it comes to anti-oxidants. Typically when we see cancer, we saw large amounts of free radicals. Researchers then concluded that free radicals cause cancer!!! Latest research shows that cells produce the free radicals as a last ditch effort to SIGNAL that the cell needs to be destroyed. The cell is trying to commit suicide. Neutralizing this signal by using anti-oxidants actually promotes CANCER and does not reduce it. How did you arrive at it? What about when we see large amounts of free radicals and NO cancer...? The other issue is that broccoli is only as good as the soil that is used to grow it and those soils are highly depleted after a very long period of abuse. That's why farmers have been practicing crop rotation for..oh..just over 8000 years or so. @Whydening Gyre, wish I could find it now. I read it on here, last year sometime. Studies have been done that show that taking large doses of Anti-Oxidants when you have Cancer, actually decreases the time you have left to live compared with what would be expected. I wish they would find me just one reason not to eat it. Worse vegetable ever. In a recent BBC documentary, they showed that all these superfoods are just a gimmick and waste of your cash, since very little of these anti-oxidants make it into the blood stream. Also, the body has a normal level for anti-oxidants that it naturally maintains and when you spike it, it then tries to get rid of the excess and actually results in it dropping below normal which then takes a while to recover.